The Ukrainian Lutheran Church has been blessed by the visit of Professor Jonathan Bare from the Wisconsin Lutheran Seminary. Professor Jonathan Bare has provided instruction in Greek for Deacon Vladyslav Horpynchuk from the Resurrection Lutheran Church in Kyiv. Professor Bare has also led Training of the Spiritual Leadership: Lessons from Titus seminar for pastors and deacons of the Ukrainian Lutheran Church. 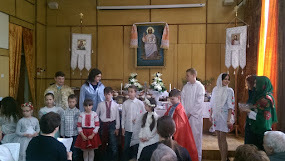 The seminar took place in the Holy Cross Lutheran Church in Kremenets. We thank God for the fellowship we enjoyed on these blessed days.